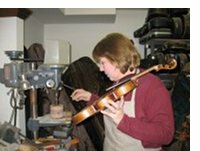 At Master Hand Violin Shop, we have a reputation for the highest quality repairs around. We are one of only a couple stores in the entire Virginia area that performs any needed repair on violins, violas, cellos, basses, and bows. As we are a local business, all repairs are completed at our store; we never send out. In most cases, the instrument needing repair will need to remain at the shop for a few days; occasionally repairs can be done while you wait. The length of time for a repair to be completed depends on the repair itself and our current workload. Loaner instruments or bows are available for use while an instrument is being repaired. The following is not an exhaustive list of the repairs Master Hand performs, but rather, this list includes prices for some commonly needed repairs. To obtain the price of an unlisted repair, please call the shop at 630/292-2641. Old instruments that have not been played in several years will need to be brought to the shop for repair cost estimates.